Do Dogs Have Baby Teeth That Need to Be Pulled? Will My Dog's Baby Teeth Need to Be Pulled? Q. My puppy still has a baby fang tooth, even though the adult fang has come in above it. Will it come out on its own? Should I pull it? A. For starters, do not pull the tooth yourself. You didn't say how old your puppy is, but if he's not yet 6 months, the tooth may well come out on its own. If he's older than 6 months, talk to your veterinarian. Removing retained baby teeth is important. If they’re not removed, food can collect in the gap between the adult and baby teeth, leading to decay and gum disease. Retained baby teeth can also affect the alignment of the adult teeth, and since they were never intended for long-term use, they are more easily fractured. As long as your veterinarian pulls any stubborn baby teeth, though, there will likely be no long-term problem. Baby teeth are called “deciduous,” a word that means “falling out or off at maturity,” which is what baby teeth are intended to do. 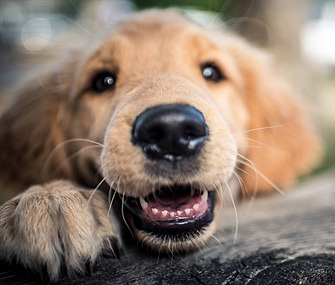 Dogs have 28 baby teeth and 42 adult teeth. Cats have 26 baby teeth and 30 adult teeth. People have 20 baby teeth and 32 adult teeth. The four large, pointed teeth on the corners, top and bottom, are known as “canine” teeth in dogs, cats and people. A final thought: Good dental care improves the quality of your dog's life and likely extends the time you have together. Talk to your veterinarian about at-home care that will keep your dog's choppers in fine shape for life.